My kids have been really rotten to each other lately. As in not treating-others-the-way-you-want-to-be-treated rotten. The most repeated offense has to do with the fact that they both hate being upstairs alone. So as soon as I call them down, the one closest to the stairs takes off with a wicked smile on his or her face, leaving the sibling wailing in the dust. It has been very noisy in an unpleasant way and I have been starting to suspect that my kids are evil. So, I felt I had to do something. I hate that I have to give incentives for them to be kind to one another, but I needed a tool. 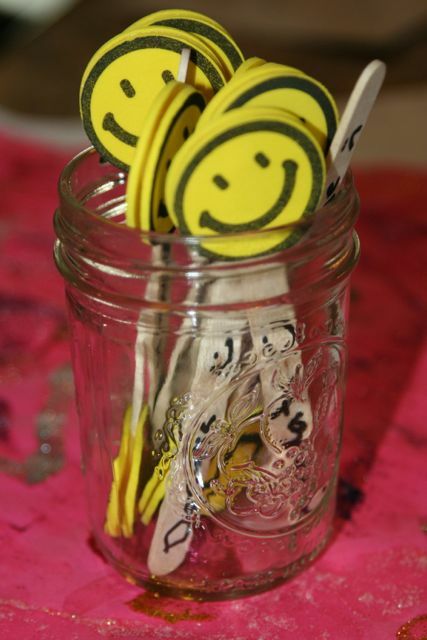 And here it is: The Get-Along Jar...10 popsicle sticks with smiley face stickers on one end. We started with 2 popsicle sticks face up and 8 face down. Every time I catch them fighting they have to turn one face down. If all 10 end up face down, we pull one at random and they owe me the consequence written on it (30 minutes of clean up; 1 hour in your own room; lose screen time; 30 minutes in your own room; each owe mom $1). This has happened once so far and they pulled 30 minutes of clean up. I have to say, I really liked that consequence! If all 10 end up face up, we pull one at random and I owe them the reward written on the opposite side (sleep in mommy's room tonight; donuts for breakfast; playdate with friend of your choice; rent a redbox movie; trip to Buc-ee's <the gas station that has all kinds of treats>).